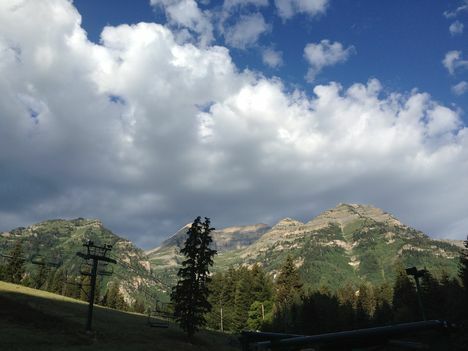 a place where you can breathe deeply," advised Cara Mertes, director of the Sundance Institute Documentary Film Program and Fund, during the opening dinner of her final turn overseeing a Sundance Institute Creative Documentary Lab, after seven years at the helm. The Creative Producing Lab, held in late July, brought together seven documentary producers (referred to as fellows) with four expert advisors for an exceptionally intensive week of give-and-take. The producers' respective projects were discussed at length and rough cuts were screened, with the intent of clarifying any story and structure glitches. The advisors and fellows analyzed funding issues as well, within the context of completing the projects and getting them out to the marketplace. while the former two happened earlier in the summer. "People are different in this space," Mertes asserts. 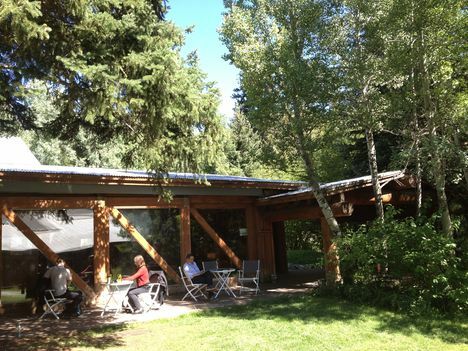 Practicalities are provided for the filmmakers, from meals to ultra-comfortable digs in the quiet canyon. "Being taken care of is so powerful for people—especially in the resource-constrained documentary community, where you're taking care of the story, your subjects, your family, your film," Mertes explains. The labs go beyond logistical work, sometimes even tackling the stymied dynamics of a filmmaking team. "In the independent community, the work stems from passion and commitment," Mertes says. "If you're not OK, your film is not going to be OK, because the two are completely inter-related. We don't ignore the heart or the head: it's both." During the labs, Mertes stays in the background, guiding conversations and sessions rather than directly leading them, interjecting when she thinks there’s something important to add. Her firm and sure point of view is there for the asking, and her deep knowledge of all available avenues to filmmakers comes from her more than 20 years devoted to the genre. 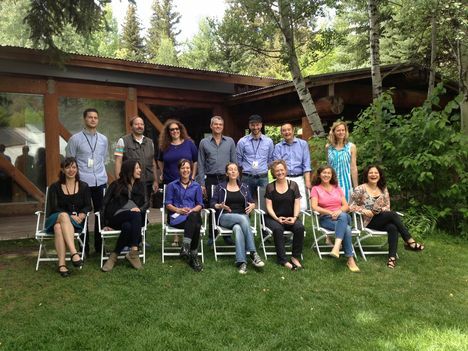 Founder Robert Redford and the Sundance Institute's remarkable legacy and past lab fellows' accomplishments are ever-present through the resort's many photos from past workshops (many participants are Academy Award-winners, including Redford himself). Posters from festival- and lab-supported films line the lobby of the screening room. In this rarefied setting, fellows, who are chosen from the wide-ranging field of Sundance Documentary Fund grant recipients (45-55 projects are awarded annually), are given the freedom and artistic support to tackle the problems and challenges of their respective projects. Everyone who participated in the lab was awed by the setting, the remarkable opportunity and the engaged community. Creative insight, real-world experiences and practical information were shared freely, but with a major caveat: participants (including this writer) had to sign a non-disclosure agreement. In exchange, the filmmakers received an honest assessment of today's marketplace and detailed, thoughtful advice from the experienced advisors on hand. Many of the most tantalizing anecdotes about buyers were deemed confidential, as was the private screening of an upcoming Toronto premiere, reactions to rough cuts, cautionary tales about equity investors, and specific project budgets. However, the advisors and fellows' willingness to speak candidly off-the-record about financial details and past conflicts enriched the experience. Fellows were able to detach from their filmmaking process somewhat; the lab is designed to give the selected projects a mighty push to the next level in the creative process: completion and eventual distribution to a global audience. Each film was considered as an individual case study, with emphasis on both subject matter and festival strategy. Although most filmmakers may dream of theatrical distribution, those aspirations need to be realized in today's distribution landscape, where release strategies are ever-evolving. In addition to Mertes, creative advisors were Submarine Entertainment's co-president Josh Braun; David Magdael, president and founder of the LA-based publicity firm David Magdael & Associates; producer Bonni Cohen, who runs San Francisco-based Actual Films, the company behind The Island President; and Motto Pictures' Julie Goldman, producer/executive producer on such documentary features as God Loves Uganda and Gideon's Army. Not surprisingly, the need for additional fundraising and finishing funds was a challenge shared by all the participants. What follows is a recap of some of issues discussed. "A lot of people want to date us but no one wants to marry us," quipped Cohen about the documentary producer's quandary. Producers need to ask and determine where to take risks financially outside of foundation funding, and should consider carefully when bringing in equity financiers. With funding comes expectations about credit and creative control. And although crowdfunding campaigns can raise an amount equal to or more than a grant, advisors recommended caution regarding incentives promised via the campaigns, due to the manpower and expense involved. Do the math on the costs, and study what has worked previously. Subjects of documentaries can be exposed in a very invasive way and vulnerable subjects need to be prepped in advance of screenings and Q&As—and ascertained if it's even appropriate that they're included, advised Magdael. Although a subject might consider the film their possible economic lifeline, it is most likely an unrealistic expectation, and should be addressed in advance. If there are controversial elements in the film, keep close control of social media and be strategic and cautious before the film's premiere. Even when a film premieres at a major festival, consider scheduling key constituency screenings and a homecoming premiere for those who are natural advocates for the film. In the end, the business is all about relationships, and filmmakers should be working with their sales agent, publicist and distribution partners as a team. "It's not a science," explained Braun about the sales agent's role. "You have to dream and think big and understand limitations at the same time." Sales agents need to counter a producer's expectations with their financial obligations. Deal structures are different from film to film, but sales deals that split the rights can often net more in total sales. On the upside, documentaries are more embraced in the marketplace. "It's incumbent upon filmmakers to talk with other filmmakers about broadcasters and sales agents and to confirm why or if it worked for them," recommended Braun. In today's competitive marketplace, a festival run indicates a stamp of approval that is used as shorthand by buyers. Each major tier festival has some meaning to buyers, and although most films will not be accepted into Sundance, other festivals and screening series (and their attendant publicity and audience) can be just as important to a film's distribution. asserted to the fellows. She noted that the power of chronicling real emotions, conversations and relationships has a real effect. Keep the work grounded and true. Kathy A. McDonald is a Los Angeles-based writer.